… and here’s [Over_Engineered_2]’s implementation in the real world. Or you can get your soap bubble machine design by looking at the Space Shuttle’s robotic arm end effector like [GordonKirkwood] did. Blender with it’s built-in game machine, or use an external one. Had a large one done in a few hours. Native measurement are really in MM! Resolution is beyond what you need to 3d print! I’ve used Blender too for designing a few things, for 3D printing and for laying things out for general design. 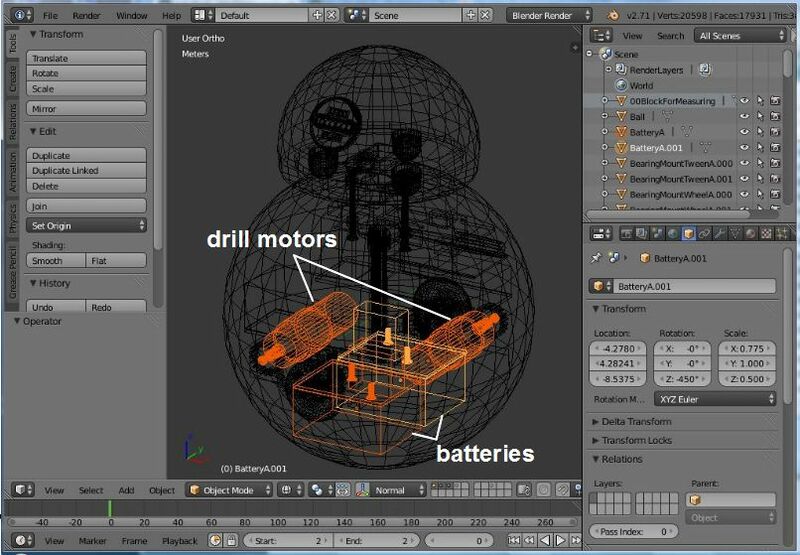 It was essential for my BB-8 droid to make sure everything fit in the ball http://hackaday.com/2016/11/30/my-diy-bb-8-problems-solutions-lessons-learned/. It depends on the type of thing you are building. Organic shapes, for example, are close to impossible to model in CAD but they are straightforward in artistic (?) 3D animation software. I’ve used Blender to model mechanical things I 3d-printed and it does the job but it is not the best tool for this. If you want to model solids for mechanisms it is much easier to use a constraint-based cad such as Solvespace or the superpowerful commercial ones like solidworks or inventor. Solvespace is the best piece of software I discovered last year and I can’t get tired of repeating how much I like it. At least three months of that time is taken up by having to listen to forum users affected by Stockholm Syndrome, telling you that all its quirks are actually features. Be glad it’s not GIMP, but yeah Blender’s NaN heritage shows through. But in fairness pretty much all the mainstream packages require a big time investment. there’s some obvious improvements by simply tuning the timing. as it is the fan starts too late and the ring doesn’t go high enough. also why go for linear movement when circular makes much more sense ..
i don’t think he understands what that means. Really? Many high precision machines are made (designed) with pen and paper even today. Learning the basics of technical drawing is easy and unless the machine is intended to be mass produced the finer details can be put down in writing. CAD can be a huge help for more complicated things but IMHO a potential PITA for smaller/simpler projects. quite frankly, this mechanism is simple enough for a child to get the things sized properly based on a hand-drawn draft. The ‘problem’ wasn’t the size of the ring. It was that a metal ring doesn’t store enough soap to create the surface of the bubble. It might have worked just fine with a pipe-cleaner reservoir to carry the solution. In the smaller ring they built in liquid retention channels.